EVO 2010 was a blast. So EVO 2011, the world's biggest fighting game tournament, should also be a...blast? 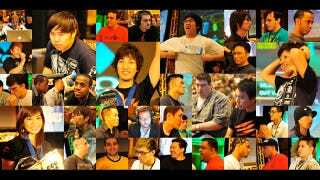 Kicking off on July 29, EVO 2011 is a three-day celebration of all things fighting, with the tournaments just one part of the draw. For those who just want to check out the latest games, there'll be playable builds of upcoming titles like Street Fighter X Tekken, Tekken Tag Tournament 2 and Soul Calibur V, while those who just want to get their drink on can hit up the big pre-show party at Insert Coin. There'll also be panels where you can meet the developers of some of the games featured at the event, bring-your-own-console showdowns and the main events, the big tournaments, which will be based around games like Super Street Fighter IV Arcade Edition, Mortal Kombat and Marvel vs Capcom 3. For the nitty gritty on scheduling and the like, hit up SRK at the link below.